For over 30 years, Leslie Keast-Patch worked as a teacher, a learning support teacher and music specialist in schools, before specialising in literacy and dyslexia. Leslie saw the frustration and concerns that parents and teachers endure when their intelligent and eager students continue to struggle to acquire literacy skills after several years of schooling, and more importantly the damage to self esteem and tragic waste of potential of so many children. Through her research, experience and work with students of all ages and abilities, it was clear there was a need to create alternative learning programs to provide opportunities for literacy learning. Some children just don't learn the way they are taught in the current school system. In 2008, Leslie created Learnersaurus in Brisbane QLD, to provide a solution for teachers, parents and students. With a growing team, the personalised coaching, workshops and specialised resources were developed with the dyslexic learner in mind. Over the following years, we created many more products for dyslexic learners, including books, stationery, games and packs. Our online shop was launched to make these available across the world! In her search for more evidence based research and practice, in 2011, Leslie completed Postgraduate studies through Dyslexia Action (University of York) in the UK. She specialised in learning the evidence based practises of the Dyslexia Institute Literacy Program, a structured, explicit, multisensory approach to literacy learning. The company has grown and we now have a busy team of Learnersaurus coaches across Australia, several schools who have implemented the Learnersaurus Literacy program, and a full range of products that integrate into the Learnersaurus programs. "Chloe’s grades have improved from D’s to C’s & B’s. As great as this, I am most proud of how much her confidence has improved and now she wants to read and write - something she would previously refuse to do, because, in her words, “it’s was too hard and it would be wrong”. " "I really enjoyed doing the Learnersaurus program. It was fun and it wasn't hard at all, and now I can read anything I want to." "The Learnersaurus Program is fantastic because it works! It was so easy for me and I'm not a good reader. It was so good to work with my son as he was having fun. He can now write and I can read his writing. This program has boosted his confidence and given him so many new opportunities." "Reuben is 11 years old, is an avid hockey player and has a creative flair for sentence writing! He has been working exceptionally hard on the Learnersaurus Program since term 4 2016. Reuben and his Mum and Dad are a testament to the great results that can be achieved when a family makes a commitment to the Learnersaurus program and improving literacy skills. By the end of 2017 Reuben had devoured most of my Barrington Stoke chapter books and this year is becoming an increasingly confident and fluent reader." "One day in the waiting room at the doctor's, James just picked up a book and started reading it. He had never wanted to read before he started the Learnersaurus program. I've learned so much too." knowledge, handwriting, decoding, blending and spelling skills. Initially, Zac could not identify all letter sounds, found decoding extremely laboured and had difficulty spelling even the simplest words. Fast forward to Literacy Workbook 3 in the Learnersaurus Program and Zac is making amazing progress! 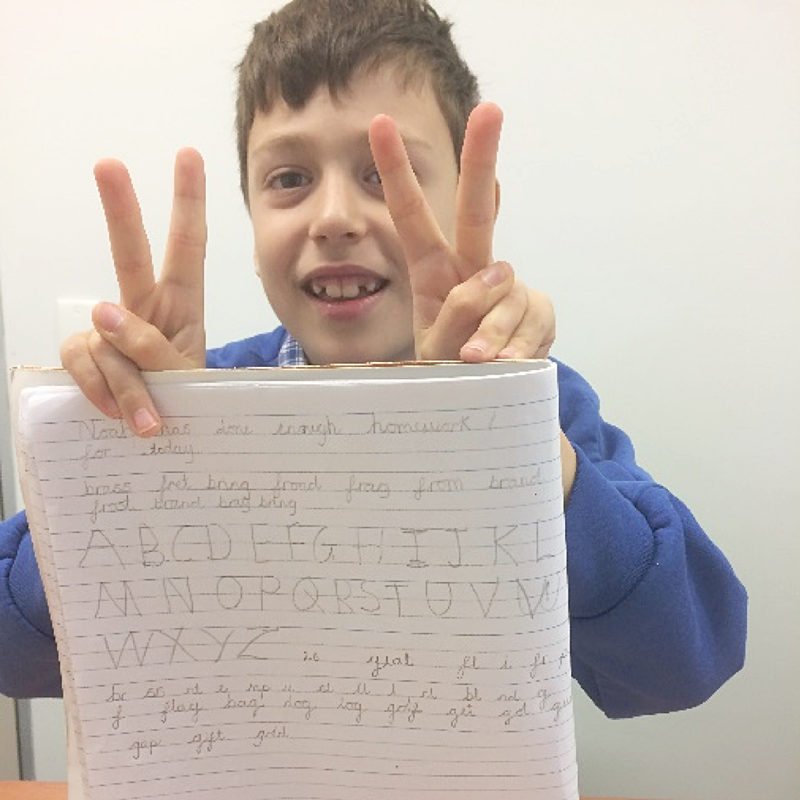 He is flying through his PM reading levels in the classroom, spelling with confidence and he has developed a beautiful cursive handwriting style." "My daughter has come such a long way, from not recognising the alphabet letters at all, to reading her Learnersaurus books over and over again!" Who is the Learnersaurus program for? The Learnersaurus Literacy programs have been developed to provide an alternative approach to literacy learning for students who have not responded to classroom teaching, and other interventions. Many other programs assume that certain processes and skills are automatic when in fact there are some essential skills that have been overlooked. After approximately 40 weeks of the Learnersaurus program, reading improves and literacy skills develop! The learner gains success and self confidence improves. How do I fit it in within c/r teaching & learning? Without reading skills, a child cannot access the curriculum. The Learnersaurus Programs and resources will build the essential skills which will empower them to read and write. How does the brain work for children with dyslexia? Reading is a very complex process requiring specific connections to be developed in the brain. A dyslexic learner requires very specific instruction in order to develop these connections. Read more about the research of Dyslexia. How can you support children with dyslexia without taking away too much time from the rest of the class? The reality is, that in order to learn to read, a dyslexic learner will require some intensive, one on one, multisensory structure language instruction. By spending some time out of the classroom to develop these essential skills, they will be much happier and more confident going back into the classroom, once they have a grasp of the alphabet, and will be more prepared for reading, writing and spelling with the rest of the class. Is the success rate higher using this program one-to-one or can this be used within a classroom setting? The Learnersaurus program is designed to be used one-on-one, however there are many Learnersaurus products that can be used in the classroom setting, especially the 26 Letters. 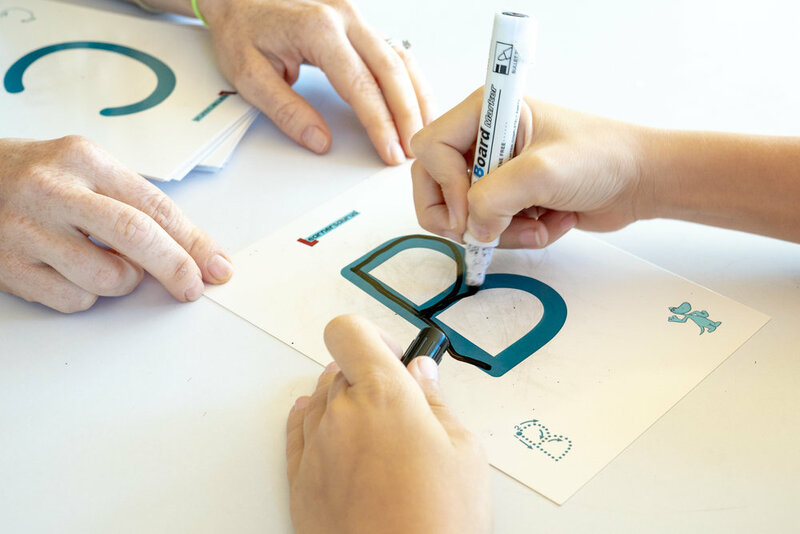 How do Learnersaurus resources help children with dyslexia? All of our resources have been developed with the dyslexic learner in mind, supporting the way that they learn best. The program ensures that the learner is engaged and achieves success. Our games, books, packs and stationery are all available online! It is conclusive from research that the key marker of dyslexia is the phonological deficit. Neurological imaging also supports this. Common co-existing conditions include dysgraphia (handwriting difficulties), dyspraxia (motor control), dyscalculia (number and number concepts), working memory difficulties, sequencing, auditory processing and attentional difficulties. How do they perceive the text? This differs for each individual. It is common for a dyslexic person to describe it as "the letters jump around", however some see the letter blur, have trouble focusing, some find it difficult to differentiate letter shape and height (eg. confusing "h" and "n", or "p and "q"). Are there any techniques to use for motivation? Success is the best motivator. Make sure you are letting the learner experience some successes (focus on their strengths) to build confidence! Cumulative learning ensures success, and repetition enforces memory. How do we get teachers on board? Knowledge is power! Educate your teachers by sharing our powerful book, Lex and Me. Seeing the success of your child should be the best way to get your child’s teacher on board. What funding is available for literacy support? It will depend on your school, but privately, unfortunately there is little support. How can I manage my child’s frustration level? Give them success and change your approach to teaching them. Try discovery learning and keep learning increments small. Our games and books are a great way to keep them engaged and have fun while they learn. How do I identify a dyslexic child? There are some key signs that indicate a learner might be dyslexic, including slow reading, trouble with multi-syllabic words, avoiding reading out loud, and more. Read more about identifying a dyslexic child. Can you grow out of dyslexia? Dyslexia is a neurological condition, genetic in its origin, so it most likely runs in your family. You cannot grow out of it, however, learning to read is possible for all learners! How can we balance school work and “extra” work in the program? Prioritise the Learnersaurus work for the morning. Other homework should be looked at carefully and only attempted if it targets the needs of your child. It needs to be suited to the child’s ability level.